In this DIY session we are building a web controlled surveillance robotic car using raspberry pi and a webcam. This could be a useful and inexpensive security and spy tool, which have many configurable options and can be built in few hours. In this IoT Project, we are mainly using Raspberry Pi, USB web camera and two DC motor with Robot chassis to build this Robotic car. It has a web camera mounted over it, through which we will get live video feed and the interesting part here is that we can control and move this robot from a web browser over the internet. As it can be controlled using webpage, means it can also be controlled using webpage in Mobile. We built a webpage in HTML which has Left, Right, Forward, Backward links, clicking on which we can move the robot in any direction. 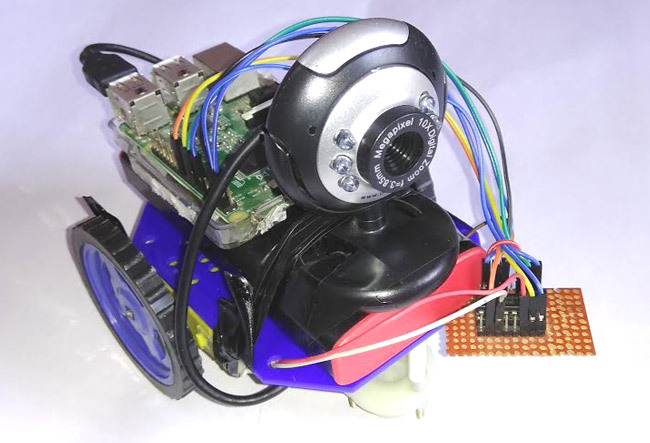 Here we used “Motion” for getting live Video feed from USB camera and used “Flask” for sending commands from webpage to Raspberry Pi using python to move the Robot, which are explained in detail in subsequent part of this tutorial. We have Raspbian Jessie OS installed on our Raspberry Pi board. You can check this article to install the Raspbian OS and getting started with Raspberry Pi. Motion (Surveillance Software) is free, open source motion detector CCTV software, developed for Linux. It detects the motion and start recording video of it. With ‘Motion’ installed in your Raspberry Pi, you can magically turn your Raspberry Pi into a Security Camera. It is used for getting live video feed, making timelapse videos and taking snapshots at regular interval. It records and saves the Video whenever it detects Motion or any disturbance in the view area. Live Video feed can be watched on the web browser by entering the IP address of Pi along with the port. We have created a detailed Tutorial on Using Motion with Raspberry Pi and USB Camera, here we are briefly explaining its installing on Raspberry pi for our Robot to send Live video streaming to webpage. Then save the file by pressing ‘CTRL+X’, then ‘Y’ and the Enter. This permission is necessary otherwise you will get error, when you check Motion service Status. Now we are done and ready to get our live feed from the USB web camera connected to Pi. Just start (or restart) the Motion service using below command and open your Raspberry Pi’s IP, with port 8081, in your browser (like 192.168.43.199:8081). In this project we have embed this IP in our HTML code in img src tag. And you will see the live feed from your web camera. Here we have used a low cost USB web camera which worked smoothly with our Raspberry Pi, but you can further use a good quality camera for better resolution. As it will show in browser, you can use any device, to watch the feed, which supports web browser like Mobile, tablet etc. This is all about using Motion for our Surveillance Robot, apart from that, it has several configuration options which we have already discussed in our previous tutorial. Note: If you are Raspberry Pi model below the version 3, then you may need a Wi-Fi dongle to wirelessly connect raspberry Pi to router. You can learn more about the programming using Flask here, also check our previous projects where we have used Flask to send the message from Webpage to Raspberry Pi and send weight value to Raspberry Pi in Smart Container. Here you can see the we have embed the IP address, on which the Video is streaming, into the webpage by using img src tag. Change the IP address according to your Raspberry Pi but keep the port same. After testing the Live Video feed and HTML code, we need to build a robot by using handmade or ready-made robot chassis, wheels, and nut-bolts. Then place Power bank over it for powering the Raspberry pi and then place the Raspberry Pi and web camera over the power bank and fix the setup using Cello tape or rubber strips, connect the USB camera with Raspberry Pi. In this IoT project, we don’t need to do many connections, we only need to connect some wires for Motor Driver IC L293D and DC Motors. Connections are shown in circuit diagram below. Here we have used a General Purpose PCB for mounting L293D IC to reduce the space but you can also use small Breadboard for connecting DC motors with L293D. Operation and Working this Surveillance Robot is very easy. Create a python file (.py extension) and copy the below code into it then save it on your Raspberry Pi. Then put the HTML file in the templates folder as explained above. Don’t forget to change the IP address in HTML file. Then open your Raspberry Pi IP address with port 5010 like http://192.168.43.199:5010 (again replace IP address with your address). Now you will see the web page having four robot control links and live streaming video. User can control the robot by clicking and holding the links. If user will click and hold the links then robot will move according to clicked link and when will user release the link then robot automatically stop. Complete Python code is given below, where we have written various functions to control the Robot on clicking the links on the webpage. You can understand them easily or if you are a beginner then check our previous Raspberry Pi Tutorials. Also visits our Robotics Section for more interesting and easy to build Robots. I want this car with complete package . i am a sri lankan. so will you send it as much as possible. total package cost how much? I'm using RPi official camera V2 i.e. the camera that uses CSI connector not USB cameras. Now I want to know where to change sothat I can get a live video feed from internet as you mentioned. "sudo modprobe bcm2835-v4l2" (Careful, on the v4l2 it's an 'L', not the number 1) to make sure the RPi knows the camera is installed and available using the bcm driver. To complete the process, we also have to tell the Pi to activate the driver after any reboot so our camera will always be available. Then we want to make sure the driver and module starts every time with the Pi by entering "sudo nano /etc/modules" and at the end of the file, add this line : bcm2835-v4l2 and you should be good to go. Reboot to clean up and you can test again with the raspistill command from above. hello, you moved the robot using commands left, right, forward, backward. in the similar way, can't you make the camera to move in different directions in its surroundings like up, left, right, down. Hello Sir. Thanks For this Great Tutorial. I just want to Ask a simple question that do we need a wifi connection for this setup? or we can also use 3G ? It will need to be on WiFi (but you can use NGROK or WEAVED to control it from 3G) or you will have to put a GSM/3G receiver on your Pi. If you do that you will be changing the IP address in the HTML file quite often. I have a error while running the python code. Anyways, I put jquery on locally since this bot also runs as an access point. I'm seeing these errors and not sure what they are? I have pretty the same mistake, could you fix it? OK, minor brain fart, that's the icon in the url bar. Where would I put one to get rid of the error? Throwing a file in root didn't work. while running the code i am getting this error if not this i am getting as "500 internal server error"
what is the range of this robot?? after this command "from flask import Flask"
I have a error while running sudo apt-get install motion. It shows a error called packages counldn"nt be found. Please tell me an an solution for this.Ihave tried many ways. Had the same problem. Rebooted, ran "sudo apt-get update" then "sudo apt-get upgrade" and was able to install motion. everything is perfectly running...just getting the small video window...how to enlarge it? Is because the port 5010 is suposely closed in my raspberry pi. In the fritzing diagram pin 12,14,18 and 22 are used but in the code 18,23,24 and 25 are used .can somebody explain why there is such a blunder mistake? Which raspberry pi we are using?